Anyone who has had a loved one serve in the armed forces knows it’s not just the person in uniform who serves and sacrifices. It’s the whole family. When you see someone wearing a Gold Star Lapel Button/Pin (left) or Next of Kin Deceased Personnel Lapel Button/Pin (right), know this person is living without his or her loved one who made the ultimate sacrifice while serving our country. The gold star tradition dates back to World War I when a service flag with a blue star would hang in the home of a family who had someone serving in the military. A gold star was placed over the blue star if the service member was killed in combat. Today, the term “Gold Star” describes a family that has lost a loved one in combat theater or on combat orders. 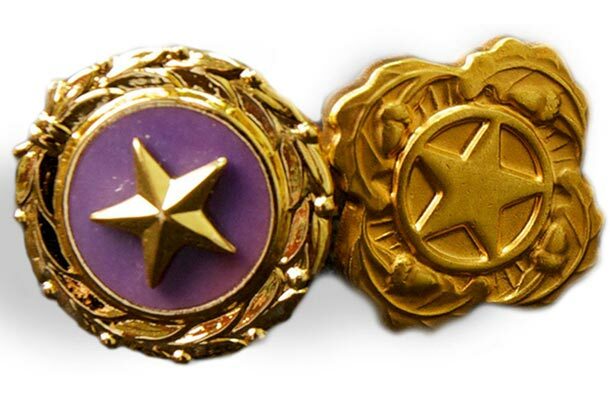 Immediate family members are eligible to receive and wear a Gold Star Lapel Button/Pin from the Department of Defense. The pin features a gold star on a field of purple surrounded by laurel leaves. Eligible family members include the fallen military member’s widow or widower, father and mother, stepfather and stepmother, adoptive father and mother, foster father and mother in loco parentis, son, daughter, stepson, stepdaughter, adoptive brother and sister, half-brother and half-sister. Another less well-known symbol of honor is the Next of Kin Deceased Personnel Lapel Button/Pin. It honors armed service members who have died on active duty while serving outside of combat operations in circumstances that don’t qualify for Gold Star recognition. The Next of Kin Deceased Personnel Lapel Button/Pin was approved in 1973 for the primary next of kin of armed services members who lose their lives while serving on active duty. It features a gold star on a gold background surrounded by four oak sprigs. Eligible family members include the fallen military member’s widow or widower, father and mother, stepfather and stepmother, adoptive father and mother, foster father and mother in loco parentis, son, daughter, stepson, stepdaughter, adoptive brother and sister, half-brother and half-sister. To learn more about applying, write to the National Personnel Records Center, 1 Archives Drive, St. Louis, MO 63138 and provide a completed Department of Defense DD Form 3.